The most obvious application of “necrofolia” is for the obsession with plants that look really good when they’re dead. (Ok, technically that would be “necrofoliaphilia,” but that’s a bit much to say and even harder to type.) Before I found Piet Oudolf’s books, it never occurred to me that there could be anything good about dead plants: that they were anything more than something to remove as soon as possible. Suddenly, holding off on fall garden cleanup was more than just laziness: it was a conscious decision to leave the bleached and browned and blackened skeletons in place until spring. 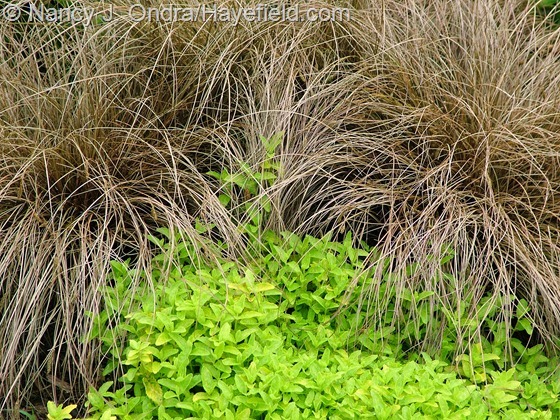 With their wide variety of post-mortem forms and colors, perennial grasses are great starter plants for budding necrofoliacs. 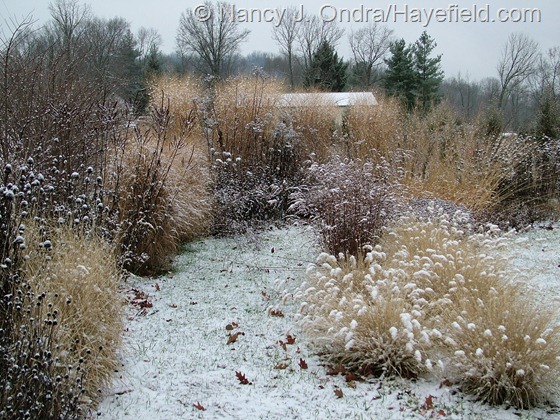 I’m especially fond of fountain grass (Pennisetum alopecuroides), such as the ‘Cassian’ clumps in the foreground above and below, for its practically indestructible winter tuftage and the way its seedheads catch the snow. 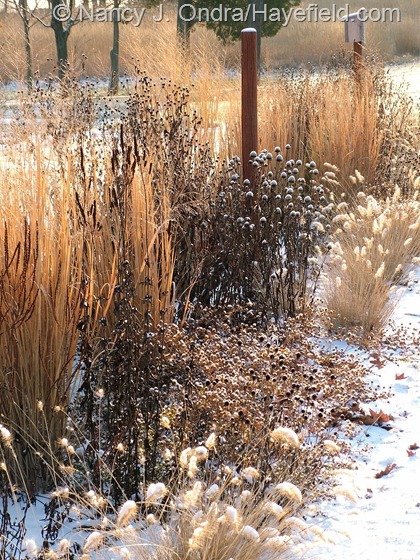 The warm brown winter color of dead frost grass (Spodiopogon sibiricus) [middle right, above] makes a great backdrop to the blond locks of dried fountain grass as well as the black stems and seedheads of orange and purple coneflowers (Rudbeckia fulgida and Echinacea purpurea). Each of the many switch grass (Panicum virgatum) selections has its own charms, but ‘Dallas Blues’ [above] has to be one of the most appealing after death, with the rich orangey brown color of its broad leaf blades and its feathery, tiered tops. 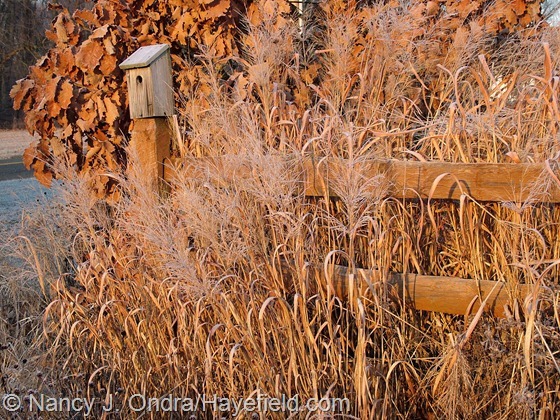 Another winner in the “Life after Death” category is little bluestem (Schizachyrium scoparium), whether its in the coppery pink color of ‘The Blues’ [above] or the rusty orange of the straight species [below]. Even definitely deceased turf grasses can look kind of charming, in the right context. 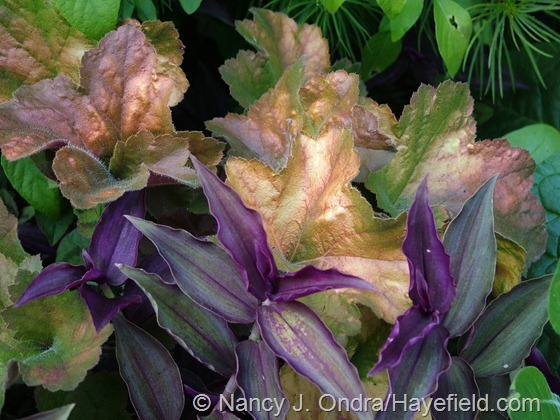 Grasses aren’t the only plants that continue to look good even when their leaves are long dead, of course. Arkansas bluestar (Amsonia hubrichtii) gets a lot of attention for its spring flowers and fall color, but it can look nice well into winter if the weather isn’t too rough. Trees that hang onto their lifeless leaves, including some hornbeams (Carpinus), beeches (Fagus), and oaks (Quercus)—such as daimyo or Japanese emperor oak (Q. dentata) [below]—are equally worthy of being adored by necrofoliacs. Once you start seeing beauty where others see decay, you may find that even long-gone annuals can have some appeal. …such as C. flagellifera ‘Toffee Twist’ [above, with Veronica prostrata ‘Aztec Gold’] or C. tenuiculmis ‘Cappuccino’ [below]. 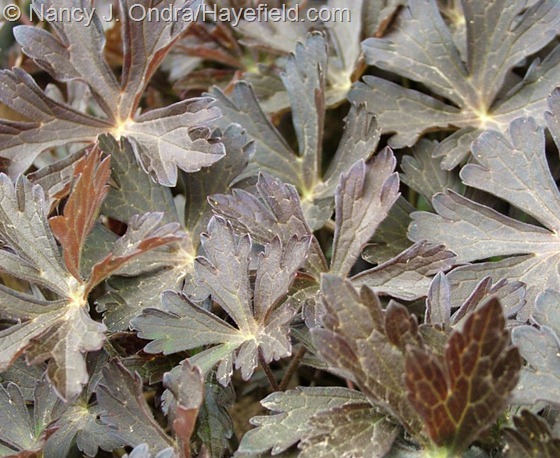 If you have no interest in necrofolia yourself, you’ll probably want to stay well clear of other gardeners with necrofoliac tendencies. Imagine the mortification of being seen with someone who’s deliberately picking out and cooing over pots of dead-looking leaves while shopping at your favorite local nursery! 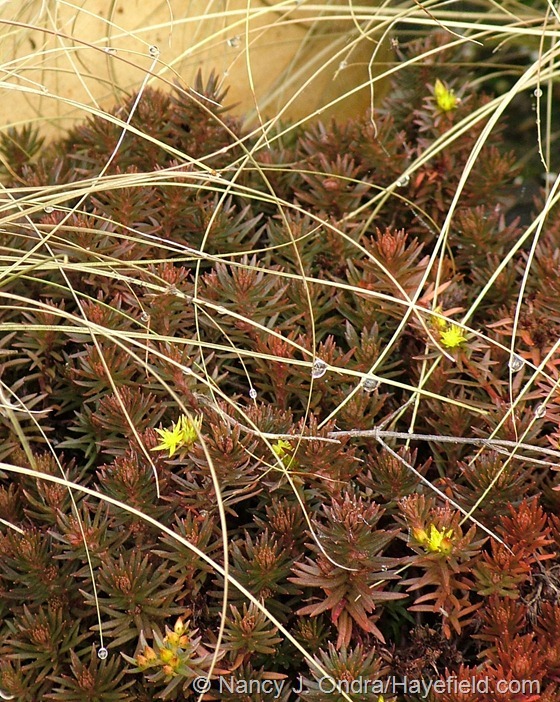 There are more yes-they’re-supposed-to-be-brown plants than you might imagine. …and Mexican feather grass (Stipa tenuissima) [in mid-July above and early August below], which, when in seed, looks for all the world like a winter-bleached grass plunked down in the middle of a summer-green garden. If you tend to forget to water your container plants, you could put a bunch of these brown plants together and maybe no one would notice whether they were dead or alive. 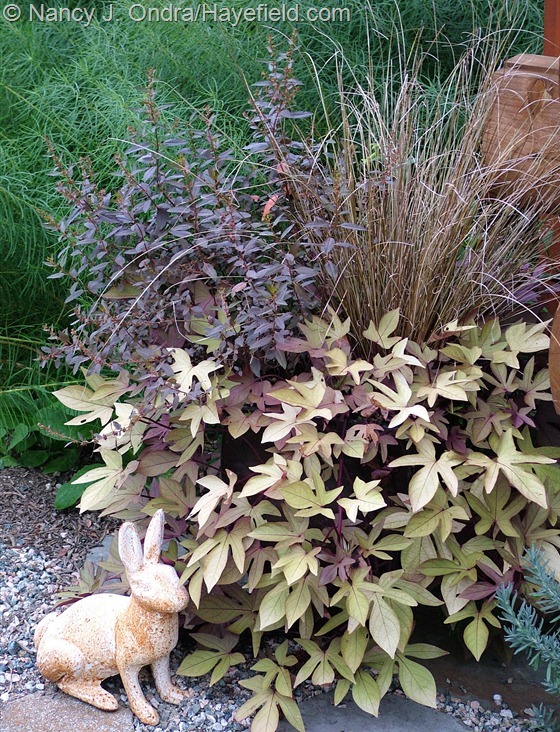 Below is leatherleaf sedge (Carex buchananii) with ‘Wellington Bronze’ toatoa and ‘Sweet Caroline Bronze’ sweet potato vine. Hey there, Ilene – glad you enjoyed it! Thanks for reading. 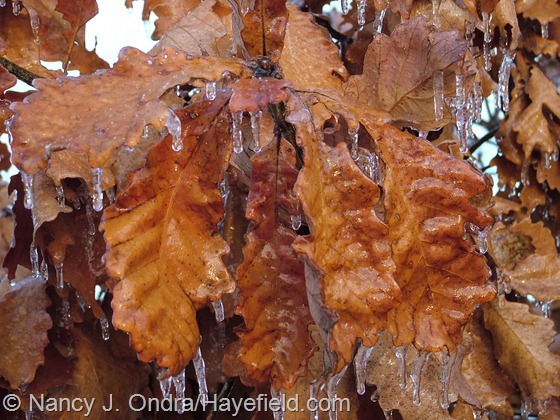 Another good reason to not get out there too soon to cut down dead plant foliage. Loved the post. Quite right, Lisa! Great to hear from you. Stay warm and think spring! Hi Sue! Those of us with relatively long winters have to take beauty where we can find it, right? 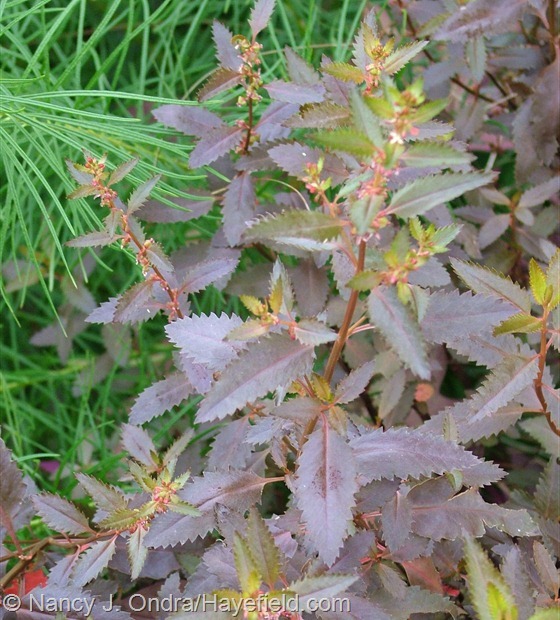 I remember as a new gardener hearing only about evergreens for winter interest. But in sites where most evergreens aren’t very happy, good-looking dead plants are definitely appreciated. I’m with you, Sandi. Though I do have to cut down most of my gardens in November to minimize vole damage (as I’ve whined about many times), I’m glad I left a few of the outlying borders standing this winter. Now, just another few weeks to go and we can start getting ready for spring! Thank you for another fine start to the day. The ‘new look’ looks better with each post. Your photography gets better and better. And the last line of your reply to Sandi says it all: ….start getting ready for spring! I don’t think it’s the photos themselves that are getting better, John: it’s the new theme, which makes them a good bit larger than they used to be. I think they might upload at a higher resolution now too, because they look clearer as well. Anyway, yes, the few tastes of spring we had in January have sure brought on an early case of spring fever. I love the Mexican feather grass leading up to your front door. Stunning. It’s so bleak here in N.E. Ohio during the winter….all those grasses would make the landscape much more interesting in January and Feb.
Hey, Mel. 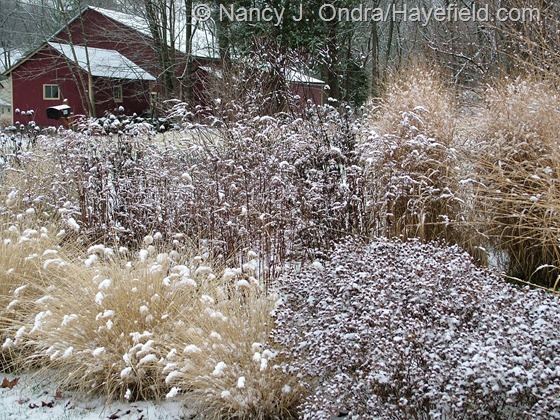 The tall grasses are especially handy, because you get to see them even if there’s a foot or two of snow on the ground! “Necrofolia”!!! Brilliant term. I think you have your next book. Oooh – you think? Yes, I could see that: a whole book filled with pictures of dead and dead-looking plants. It’d have to be a straight-to-Kindle release, I think. I wonder what category I could put it in…. Beautiful! I never understood the rush to cut down the foliage in autumn — there is so much loveliness in a brown field in winter, why wouldn’t you want that in your own garden? Hi Alan! I will confess that I enjoyed doing the bulk of my garden cleanup back in the fall, because it was much more pleasant to be out working when the weather was mild and easier on the knees to kneel on still-warm soil. And with the mild spells we’ve been having this winter, many of the bulbs are already up, so I won’t have to rush to clear around them soon as I have in the past. But putting this post together does make me wish I had left more standing this year, and I’ll keep that in mind next fall. 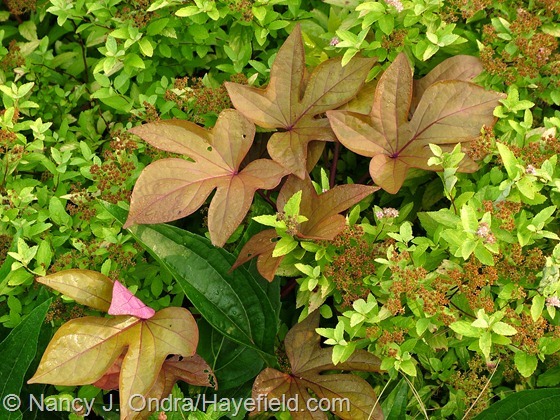 At first, I had a hard time figuring out how to use those bronzy sweet potatoes in combinations, but they actually seem to go with almost anything – especially if there are a few other orangey brown leaves or seedheads nearby. Hi Nan! Great post and wonderful pictures! 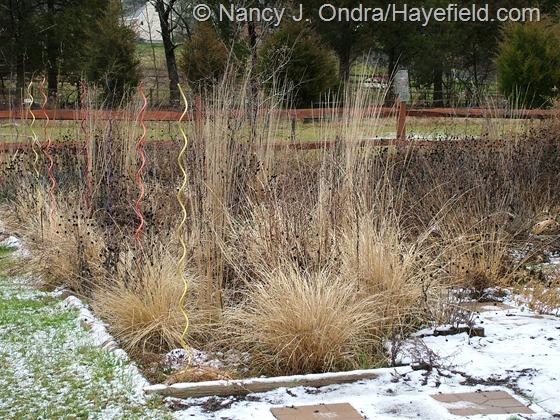 I love the look of ice an snow on a winter garden. The fact that you have nice-size drifts makes the blocks of color and texture so much more effective. Makes me think I need to move beyond the “drifts of one” style a bit more! Good point, Barbara: when you have multiple clumps, they help to support each other and continue to make a good showing even when they start to crumble. I hope your new book is going well! Such an interesting post and beautiful photos. I’ve always said that I care about winter interest in the garden when I am snug in my warm house as much as I am interested in night-time interest in the garden when I am snug in my bed. But now I am going to have to rethink my point of view…….Kudos! That’s brilliant, Tim! In many ways, I appreciate the winter-empty parts of the garden right now, when I think about them at all. When my mind is on seed-cleaning, then seed-ordering, and then seed-starting, seeing all that blank canvas makes me believe that I will actually have room for all the seedlings I plan to grow. Soon enough (right around the last frost, when it’s time to plant out the annuals), it’ll be clear that the empty places really aren’t empty at all. Hah – it’s not a very pretty word, but I guess it’s not much worse that many other new words that have come into use. Glad you enjoyed it, anyway! Terrific photos — very inspiring. I haven’t seen the bronze sweet potatoes yet — will have to be on the hunt this spring. 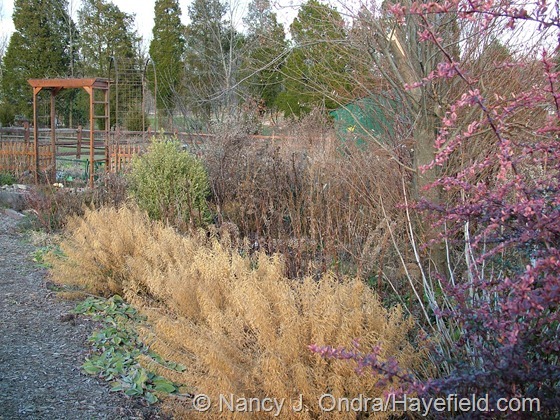 Doug Tallamy also encourages us to let plants/leaves remain to provide spots for overwintering native insects (the good guys), so there will be plenty for the birds to eat in the spring. 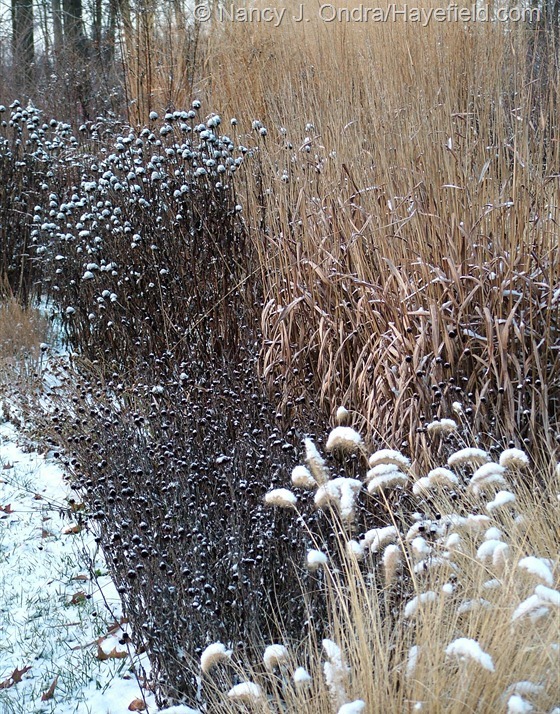 I confess that Piet Oudolf’s design book didn’t convince me, but your photos have. Thanks, Renee – that’s quite a compliment! Good point about the insect habitat. There’s the value of leaving seeds for winter birds, too, though I didn’t even get into seedheads this time. Maybe I need to do a “necroflora” post for seedheads and brown and black flowers. Love new words! Great post. Thanks, Laura! I did find that it’s not completely new: it’s apparently the name of a player or character in a role-playing game, and it also appears in the name of a moth (Pseudamorbia necrofolia: looks a lot like a dead leaf!). But as far as I know, it’s not been used in this context before, and it was much needed. Nan, I have loved dead looking plants for awhile now without ever coming up with such a great name for it. (I love necrofoliafilia, by the way and can say it 5 times fast.) But in my garden all the stems I left standing have either keeled over or look like they’ve been sat upon. I’m so envious of your gorgeous dead-of-winter garden! And, you’re leaving a wonder spot for all those beneficial insects to overwinter. Quite right, Carole – yet another benefit. I’ve owned your grass book for years but just discovered your blog…very inspiring, terrific photos, interesting topics… I’ve become a fan! Today’s post is wonderful. I too have been forced to curb my urge to leave everything intact all winter due to vole predation… but I still manage to keep some things above ground to catch the frost and snow. One shrub that looks particularly nice in winter is Hydrangea arborescens ‘White Dome’. The lacecaps are sturdy enough to withstand any amount of snow, holding it like little umbrellas, and the umber brown stands out nicely against the white landscape. My buddleias too, particularly ‘Butterfly Heaven’, have looked good all this winter. My non-gardening neighbors must think I’ve really lost it, the way I run out and photograph “dead” plants in the middle of winter! A double welcome to you, Robert! 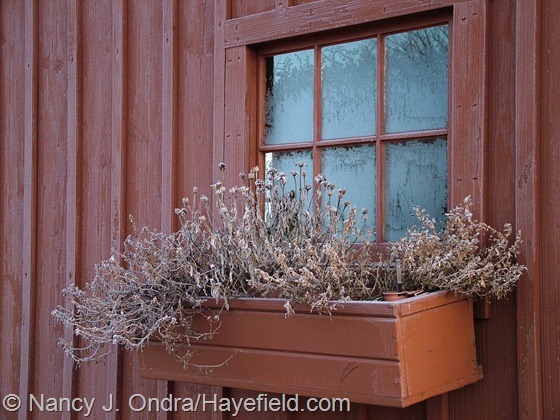 You’re so right about the great winter structure of some hydrangeas. I wouldn’t have thought of buddleias for winter interest (they generally don’t like it here, so I don’t try them anymore); good to know they have something to offer in winter too. Best of luck to you this season! Thank you Nan. Always a wonderful treat to read your posts. Necrofolia— a perfect word for those of us who love plant structure and complexity. Gold, orange and brown are lovely colors so appropriate to their season. Eternal Spring? Not for me… I like the opportunity to “slow down a little” each year just like the plants. No mowing! Besides, what would Spring be it there was no anticipation? I don’t know how gardeners who live in mild-winter areas manage to keep up their enthusiasm level year after year. I’m usually worn out by late October and, like you, am very grateful to have some time to rest up for the next season. And yes, hooray for no mowing, and no bugs either! Nan, Great photos. I love that “tombstone”! Not your usual garden ornament. 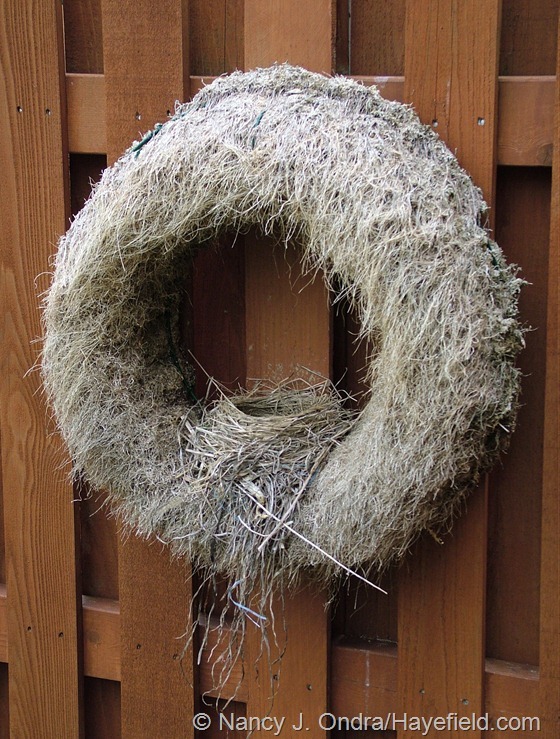 And the turfgrass/birds-nest wreath! How did that escape your “boy’s” notice? Thanks for the smiles and the inspiration. I don’t know what possessed me to buy that little tombstone casting ages ago: I think it’s because I find the choice of punctuation amusing (“O! 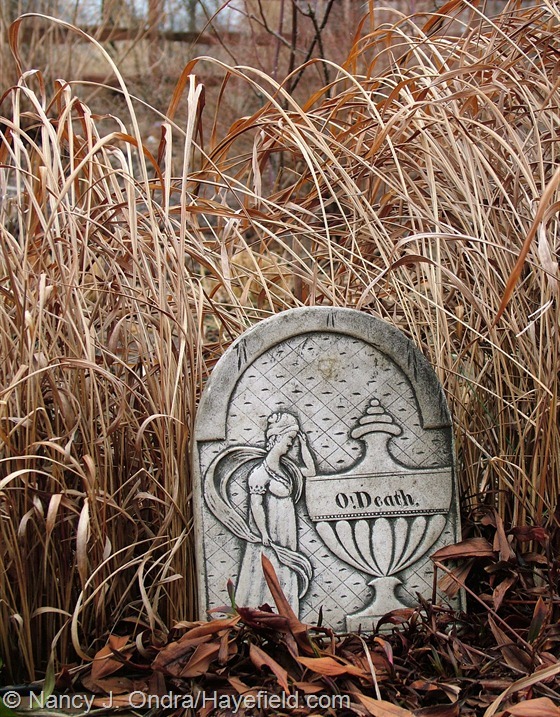 Death.” – why not “O Death!” or “O…Death?”). I’m sure the boys would have gladly munched on that wreath if they’d been able to reach it. That was a one-time experiment; keeping it watered was a nightmare. It was cute while it lasted, though. Lovely photos, both of the dead plants (though I would never have those in my climate, plus its supposed to be bad Feng Shui especially for one’s love life!) and of the live plants, of which I love the bronzy sweet potato vines. I would love to get that to add pizazz to my containers! Oh my, Nicole – that doesn’t bode well for those of us in temperate climates! Curiously enough, I’ve occasionally had the bronzy sweet potatoes set viable seed, which the plants usually don’t do. If I’m ever able to get seeds again, maybe I can send you some to try. Not only are your photos beautiful, but ‘Necrofolia’ would be a great name for a gothic gardening blog! Oh yeah!!! I was actually planning to cover black leaves here too – had pulled the photos and everything – but then thought that maybe I’d already taken the idea a little too far. Might you devote a post to the “semi-evergreen” foliage of perennials like Euphorbia ‘Ascot Rainbow’, Carex morrowii, variegated Liriope? Definitely, Eric – you get credit for necrofoliaphobic, and…ooh, necrofoliation too: good one! Thanks for the post idea; I’ll have to see what I have in the way of photos. Loved this post. I remember in another post you also mentioned cutting down your perennials and grasses in the fall because of voles. I imagine you must have noticed a considerable difference or you would no longer be doing it. Can you explain further? Sure, Karen. I ought to have known that voles would be a problem when I started gardening here, because we’ve always had them in the meadows and pastures on my parents’ farm just across the road. It wasn’t so bad for the first few years, maybe because I’d mowed the meadow regularly the first year, while the house was being built, and it took a few years for me to get much going in the way of perennial gardens. Gradually, though, I found that when I went to do spring cleanup, there was major plant damage in both the garden and meadow: perennial crowns were completely eaten from below, and young woody plants were girdled at the base. Several years ago, I decided to start mowing the meadow in November or December, so the hawks that hunt around here could more easily spot the voles. That helped the meadow, but the practice backfired on me, because it just drove more voles into the garden. So now, I start cleanup at the house and work outward: gardens first, then the nearest meadow areas (mowing and then hand-trimming around the base of the trees and shrubs I planted), then the back and upper corner when time and weather allow. That seems to be working very well: I’ve seen no winter damage for the last couple of years. So this winter, I took a chance and left a few of the outermost borders standing. I realize how much I’ve missed seeing the dried plants and seedheads. I’ll have to wait until spring to see what’s happened in the way of vole damage; if it’s not a problem, then I’ll try leaving those areas again next year. Thanks for the motivational photos, Nan. Now I can’t wait to develop drifts of winter interest and will try to resist chanting ‘hurry up and die’ to my summer plants. 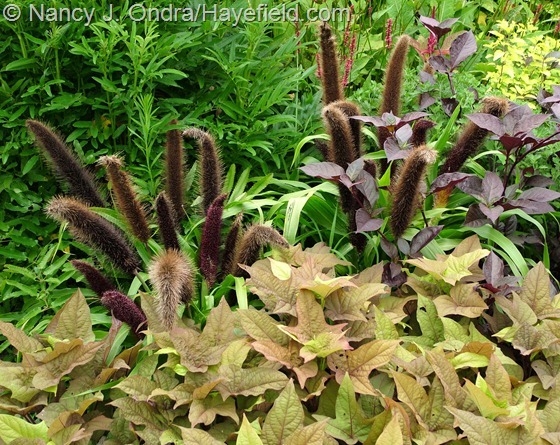 My only two interesting plants are Pennisetum Moudry which looks great in late fall with those smokey plummy plumes but does not hold up well as winter wears on and a tall indestructible sedum with dark chocolate stems and heads that might even make it through next winter if I don’t cut it down first! 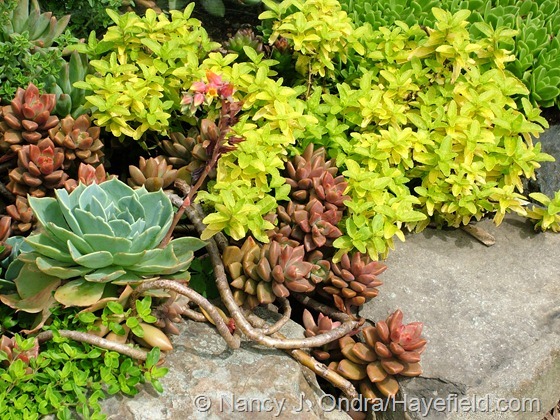 Some of those upright sedums can be amazingly sturdy! ‘Moudry’ really is beautiful in fall. It’s one I’ve not planted here, because I’d heard that it was very prone to self-sowing in some areas. But then, I’ve been finding seedlings of ‘Cassian’ in the meadow for a few years now, so I guess I didn’t save myself any worries on that front. But I am indeed a seasoned necrofoliac – I loooove me some dead flowers/leaves. I’ve got pitchers full of passed away poke berry branches all withered and dead, sitting on my dining room table. Long-forgotten bouquet’s of “Autumn Joy” Sedum, Rudbeckia seed heads, Perovskia atriplicifolia (Russian Sage) leaves, and my Hellebore “Ivory Prince” foliage adorning glass vases on my kitchen window. I pick flowers and plants and set them in vases with no water, waiting for them to slowly wither where I’ll hang them upside down to keep their blooms upright. I have yellow and orange roses (dried and preserved) that I got for my high school graduation… almost ten years ago! They’re In my bathroom – in a cute blue-glass container! Yep, I’m a necrofoliac through and through. I imagine that someone must have thought of the word before, even if they didn’t put it in writing, so there’s no way I’d claim copyright to it. But if it makes you feel better, then it’s a-ok with me for you to use it. I’m thrilled that it’s inspired you to finally start your own blog, Donna. And I assume you’ll be doing the zombie illustration yourself? Make sure you send me the link when you get up and running! Thanks for visiting, Rick. I’m up in northern Bucks, so not all that far away from you. I looked back over the post, but I’m not sure which photo you’re referring to; maybe it was in a different post? Anyway, from your description, it sounds like the far corner of the front garden: I do have ‘Dallas Blues’ there, and some ‘Rotstrahlbush’ growing nearby, so that’s probably what you wanted to know. Hi Nancy! Sending warm sunshine from Indiana today. I agree, it is better to let it be… but when it starts getting into the 60s it is hard to keep me for playing! Hope all is well. Thanks, Brooke; it’s much needed and appreciated. If it were in the 60s here, I too would be out cutting stuff down. As it is, it may all be well covered with snow in a few days. Sigh. Ah, it almost makes winter worth it! Yep – though it depends on what kind of winter we have! Thanks for visiting, James. very intersting thoughts and wonderful pictures…enjoyed this post! Thanks so much, Sharon! I guess you don’t see much of this during your winters. Hello from France, I just discovered this site through a friend who sent me the link, and ….whaouuuu Nancy Ondra’s book “grasses” has been my bible for some years now ! and …;whaouuuuu x 2 , I am a necrofoliaic myself ! I am just delighted with all the photos and all the comments, and see that nearly everybody has gone through the same lane as me : fall cleaning/cutting/tidying for years and then changing the way I see the garden and the dry flowers and grasses and keeping them as long as I can during winter. However, I do think that we have been helped along this lane by the new ways of planting, and new cultivars, and the more and more important use of grasses ! I shall be visiting Piet oudolff garden next august, I a alredy thrilled ! Hello Nicole! Welcome to Hayefield. I’d forgotten that Grasses has been translated into French. 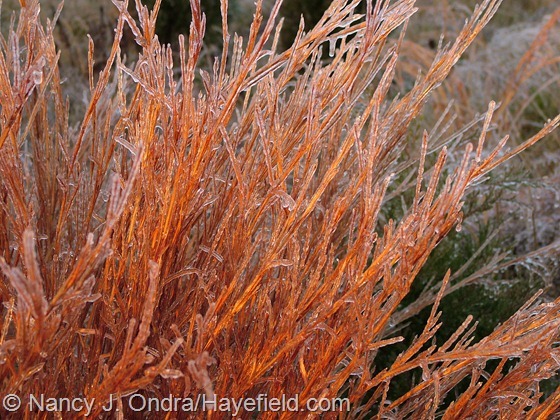 I believe you are right: the increasing availability of new and useful grasses has made winter more enjoyable for many of us. Have a wonderful visit to Piet Oudolf’s garden. I’ve never been there, but I’ve heard from friends that it’s a memorable experience. I shall send you some photos ! have you heard of a French garden called “Jardin Plume” ? 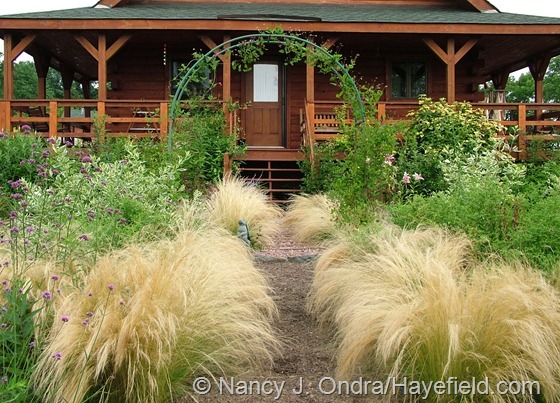 they use grasses in a lot of different ways, and they have a “fall garden” which is absolutely incredible ! Oh yes! 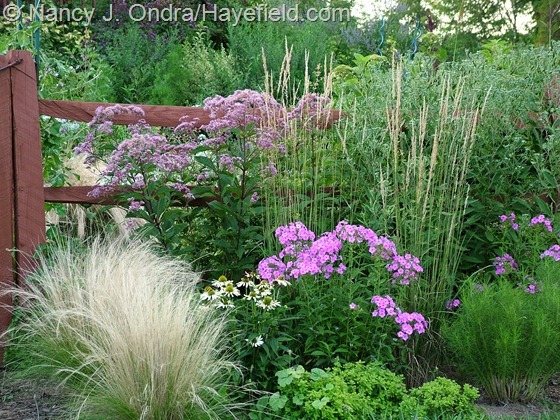 I saw it in Gardens Illustrated (I think), and it inspired me to use criss-cross paths in my own meadow. I wrote about it here: A Nod to Le Plume. You are *so* lucky to be able to visit there often, Nicole! It is February and I am just now cleaning the garden. The birds have been feeding on the seeds all winter. I like watching the garden through its entire life cycle, so yes, I really enjoyed your photos. Thank you, Charlie. Yep, leaving the seedheads is really a draw for the birds as well. I realize now how quiet is was around here during the winters I had cut everything to the ground. Love this Nan. My ‘winter interest’ is currently totally buried but then winter is more than half over. All your pictures are divine. Thanks for visiting, Layanee. I hope you get to see your garden again very soon! Oh Nan, be still my heart. I grow so many of those grasses, and this year, I’m trying the millet seeds to get more seed heads. Winter interest is something I crave in a brown and gray Oklahoma winter only occasionally broken up by snow. 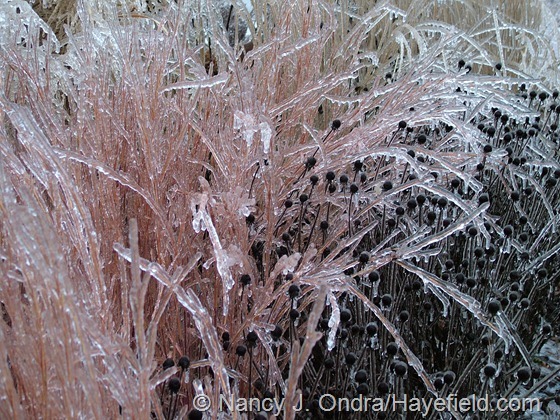 Don’t you think ice really sets off the grass seeds and flowers? Also, rose hips are splendid encased in ice. 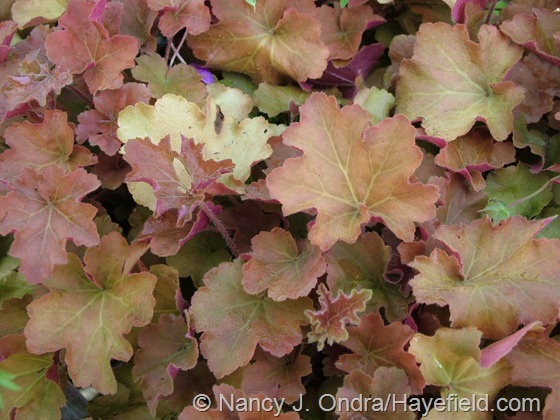 Heuchera ‘Southern Comfort’ is hands down the best coral bell for our area. It never dies in this heat, and in a sheltered spot, it stays beautiful nine months of the year. Happy Valentine’s Day. Hi there, Dee! I should try leaving some millet for the winter; I usually cut all the heads for the seeds. Heuchera ‘Southern Comfort’ is a stellar performer here too; such a beauty for so much of the year. 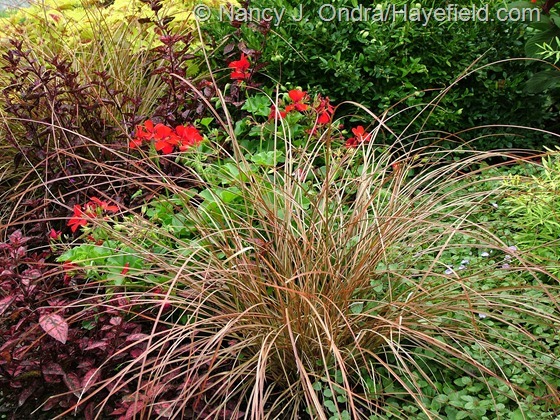 I am bookmarking this post so I can make a list of grasses for my garden. They do add so much. And I clipped your comment about vole deterrence to my Evernote. Hi, Kathy – I’m glad you found some useful info in the post. I know you have lots of space to fill at your new place. Good luck this year! Oh Nan, this posts speaks to my heart, to be sure. I’ve been so busy with work this winter I almost feel like I’ve totally missed out on the spare winter beauty my garden has to offer. Your second image, in particular, really shows the magic of the season…somber, skeletal, but honest. I JUST started cutting things back this past weekend…it’s amazing how barren the garden seems for a little while afterwards, especially without the grasses. I’ll admit to being pretty tired of the remaining skeletons at this point, Scott, when there’s the hope of new growth appearing in the next few weeks. I hope that you’ll have the time to enjoy your garden when spring gets to you!